Shopclues Is Running A Great Offer Where You Will Get A Gift Voucher Worth Rs 500 On Booking IRCTC Tickets With HDFC Credit Cards. Offer Valid On Train Tickets Booking Via IRCTC.co.in Website And Making Payment With HDFC Credit Cards. 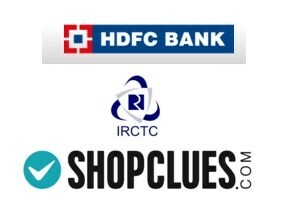 Get Rs.500 ShopClues Gift Voucher on IRCTC Bookings with HDFC Bank Credit Cards. Planning a Journey this Winter? Now get Rewarded with Shopclues Vouchers worth Rs.500 on Booking Train Tickets on IRCTC. > Book your Train Tickets at www.IRCTC.co.in with HDFC Bank Credit Cards & get Shopclues Vouchers worth Rs500. > Offer valid on Train Ticket Bookings on www.IRCTC.co.in till 31st March,2016. > Max Vouchers per month per card Rs500. > Vouchers would be sent to eligible customers within 60 Days of the last day of the month in which the Ticket is booked. > Cancelled Tickets will not be considered for the offer. > No min ticket value is required. > The minimum purchase amount required to avail the discount is Rs.2,000. > The maximum discount that can be availed per transaction is Rs.500. Uncategorized shopclues loot, trainticket offer. permalink.